Meet Ordell and Louis, two small-time crooks in search of a get-rich-quick scheme. Everything they dream seems within reach when they kidnap a millionaire’s wife and hold her for ransom. It all goes without a hitch…until the husband doesn’t want her back. 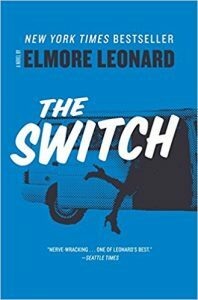 A light caper novel with a gift for flavorful dialogue and for the details of Detroit, The Switch exemplifies author Elmore Leonard’s hard-boiled leanings and dry humor. The mismatched trio of abductors and victim is great fun, and wife Mickey turns out to be the real draw. The fun can continue for book-to-movie buffs; it was adapted as the 2014 release Life of Crime.